Americans who travel around Europe often marvel at how well treated dogs are in some countries, how the four-legged are incorporated into the routines of public life with a minimum of fuss. Just one more member of the family, the attitude seems to be, a bit furrier. If only getting your dog there wasn’t so tough. As Diane Silver, this week’s interviewee, makes clear, if you have a small enough dog to travel in an airline cabin and you prepare in advance, traveling to one such country, Italy, is very doable. A writer, public relations consultant, and blogger at To Dog With Love, Diane is best known in pet circles as the caretaker of the charming Cosmo Havanese; if you’ve attended a BlogPaws conference, you’ve doubtless met the little love sponge. It’s clear from his presence at all these conferences that Cosmo is a seasoned traveler — but traveling overseas is a different animal, as it were, because of the longer flight times and the additional paperwork. Cosmo had the advantage of being trained to love his carrier almost as soon as he was brought home by Diane as an 8-week-old puppy. He took his first trip at 12 weeks. He also had the advantage — though it didn’t become clear until later — of being trained to use pee pads because he and Diane lived in a condo. When you’re not sure when the next patch of grass is going to come your way, it’s important to be a versatile urinator. Filling out the proper paperwork, finding the right size carrier, getting your vet to sign off on your dog’s health certificate — these are additional issues that are key to success in traveling abroad. 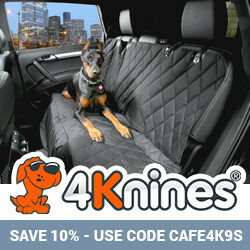 Diane offers more detail on both topics in these two posts: How to Prepare Your Dog for a Long Plane Flight and International Paperwork Preparation. Compensations for all this advance preparation? Hiking in the snow, riding a funicular, being able to hang out inside restaurants in the big cities of Italy… And of course Cosmo acquitted himself admirably as a canine representative of the U.S., being both well behaved and cute as all get out. Although Cosmo is very weight-height appropriate — much of his “bulk” is pure fluff — at 16 pounds, he is pushing the weight limit of a dog who can be accepted by the airlines. And he is also pushing the weight limit of a dog who is easily hefted over a shoulder. Imagine when that shoulder has undergone surgery and can’t take any weight. In addition to her experiences taking Cosmo overseas, Diane adds information about traveling with a pet when with a physical limitation to the conversation. It’s all fascinating — and fun. Everything, including Italy, goes better with a dog. Listen up. 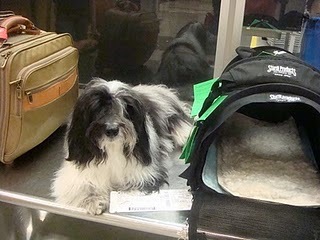 This entry was posted in Edie Jarolim, Pet Travel and tagged Cosmo Havanese, Diane Silver, international pet travel on September 12, 2011 by Edie Jarolim.